Pessimists abound. Especially when it comes to aging. During the holiday period, I was reading a magazine piece on aging where the theme was “so much behind us; so little ahead.” That caused me to recall another’s definition of “old” as when you cross the tipping point, with fewer years going forward than you’ve already chalked up in earlier stages of life. This “tipping point” view of aging was accompanied by the image of a teeter-totter. From your days as a youngster to your bonus years, the teeter-totter goes up and down, representing the good years and the bad, the pain and pleasure, triumphs and tragedies – the struggles of everyday life. But once you reach the tipping point, the writer tells us, the years behind cause the teeter to totter down behind you, leaving the rest as an uphill struggle – with fewer triumphs, fewer pleasures and fewer good years. I’m not trying to be Pollyannaish about the realities of aging. There are lots of issues as our body slows down, suffers wear and tear and our joints begin to creak, sometimes dramatically as you retreat to a walker or a wheelchair. Similarly, our mind slows down or sometimes worse, quits remembering. But over the holidays I encountered another reality. It’s a reality from cooking. My wife says it is called “reducing.” Not the Jenny Craig type, but the making-good-sauce type. By listening to my wife (which, of course, I always do), I learned that reducing in cooking is the way to make delicious gravies, syrups, stocks and stews. 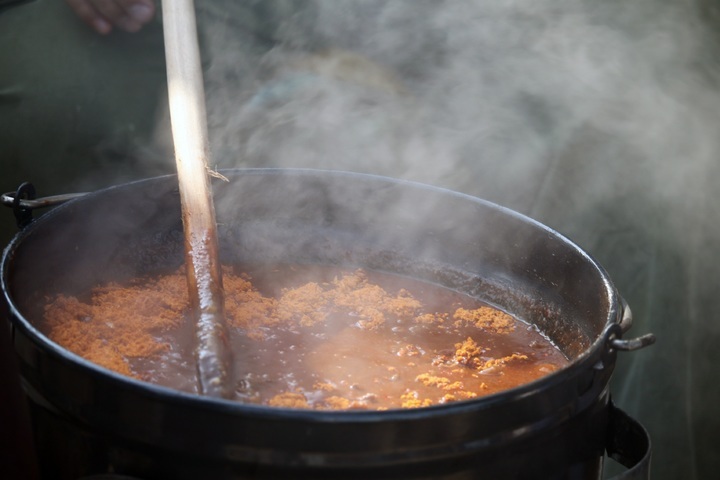 By simmering a casserole, stew, soup, or other liquid, you can thicken the consistency and end up with a more concentrated and intense flavor – like in candy! The main trick to reducing in cooking is to give your liquid enough time to simmer in an uncovered pan. I like that concept – that by purpose-driven simmering you end up with a more concentrated and intense flavor. Isn’t that what happens when we grow longer in the tooth? We display more virtues – more patience with others (especially grandchildren), more generosity, more friendliness, more frankness and candor (often to a fault) and more focus and discipline in how we spend our time. Sometimes these virtues come across as outspoken, stubborn or single-minded. Still, what you experience when you deal with a person whose life is marked by healthy, purpose-driven simmering is a richness of observation, insight and knowledge that you could never experience in someone younger. Put another way, age 72 will almost always beat age 27 when it comes to wisdom (the combination of knowledge and experience), insightfulness and judgment. Though I have no interest in learning the art of reduction in cooking, I do credit the concept of simmering as giving me a more positive way to think about aging. This line of thinking also reminded me of my own youth, when I spent two summers working in the remelt department of the Aluminum Company of America in Lafayette, Indiana. ALCOA summer jobs were good jobs because they paid well and you tended to work a different job every couple of days. I was fascinated by one of the early stages of transforming recycled aluminum into an ingot to be used in an extrusion mill to make tubing, pipes, rafters, etc. The process is like pushing toothpaste (molten aluminum) out of a tube to create the shapes. But before they could make an ingot of pure aluminum, they would place the scrap aluminum recycled from, for example, lawn furniture and airplane wings into a large vat. The vat would be heated to around 900 degrees, creating molten metal out of the scrap. As the scrap liquefied, all the impurities would rise to the top of the vat – paint, wood that was overlooked and other non-aluminum elements. Then a worker – a job I performed several times – would come along with a big rake-like tool and scrape the molten impurities off the top. He would do this several times because ridding the vat of all impurities took time. After enough time, the result was aluminum with most of its impurities removed. Because, over time, we learn to shake off habits and values that do not work or are not pure – as we learn through “the college of hard knocks” what’s really important in our life – I think the preparation of recycled aluminum, which forces the impurities (such as the desire for money, fame and power) to rise to the top to be removed, is a good metaphor for thinking about what happens to us as we approach and then live through our bonus years. So, in a technical sense – if you live by the numbers – those of us in our bonus years will undeniably have more years behind us and fewer years before us. But not necessarily less life before us. Indeed, as the old saying goes, “It’s not the years in your life that matters; it’s the life in your years.” And all you have to do is to look at grandchildren to know there’s much more life than you can ever handle. Share the post "Aging is about embracing life’s experiences"